The Dallas Cowboys are without Tony Romo for the time being, and are relying on a rookie quarterback. That can be a scary proposition for some franchises, but the offensive line and running back situation of the Cowboys allows for some mistakes from under center. Joseph Ferraiola analyzes the Dak Prescott regular season debut in which the rookie impressed with his poise, but showed a lack of pinpoint accuracy. It was a disappointing result for the Dallas Cowboys in their season opener against the New York Giants. The Cowboys lost 20-19 on an out route to Terrance Williams who made a poor decision to run for extra yards instead of going out of bounds with 12 seconds left in the game and no timeouts. However, one play didn’t decide the outcome. The game was lost in part because Dallas’ offense could not convert long drives into touchdowns. Instead the Cowboys offense, which held the ball for 36:43 minutes, managed only one touchdown in three red zone trips. They relied heavily upon the leg of Dan Bailey who went 4-for-4 with two deep field goals of 54 and 56 yards. There was a silver lining to the loss, however, and that was the play of rookie quarterback Dak Prescott. Prescott impressed early as he went 6-for-7 on the opening drive of the game that led to a field goal. Prescott’s only incompletion on the drive came on a drop from Cole Beasley that would have been a walk-in touchdown. Earlier in the drive on a 2nd and 9 from their own 26, the Cowboys are in an i-formation with 21 personnel. New York’s defensive front has seven men in the box. When the ball is snapped Prescott (#4) fakes the handoff to Ezekiel Elliott (#21). The play action makes it difficult for Elliott to pick up the blitz of Dominique Rodgers-Cromartie (#41), who comes from the cornerback position. Elliott tries to adjust, but is unable to. Rodgers-Cromartie blitzes freely off the edge forcing Prescott to scramble to his right. The rookie QB is poised and calmly avoids the blitz making a strong throw off his back foot to Dez Bryant (#88) on a comeback route for a gain of eight yards that sets up a 3rd and 1, with the first down picked up by an Elliott run. Prescott also displayed his poise in the pocket on this play late in the first quarter. Facing 3rd and 7 on the New York 27-yard line, Dallas is in 11 personnel from the shotgun with a trips formation to the left. New York’s corners are pressing at the line of scrimmage. As the ball is snapped Prescott surveys the field, looking at tight end Jason Witten’s (#82) side of the field, then the opposite half before looking back and delivering a pass to Witten on a curl route run toward the outside portion of the field. Witten was an invaluable weapon for Tony Romo, especially on third-down plays like this. Nothing has changed with Prescott lining up behind center. Cowboys’ offensive coordinator Scott Linehan did a nice job of playing to Prescott’s strengths, especially with play action. On the first play of the Cowboys’ third drive, Linehan dialed up a play that utilizes Prescott’s mobility. Dallas is in 12 personnel with a single back and runs play action, forcing the defense to flow to the right while Prescott rolls out to his left. The receivers to the left side of the field run a sail concept. Prescott has the option of throwing to Witten, who works across the line into the flat, or a deep corner route to TE Geoff Swaim (#87). Prescott delivers a pass to the wide open Swaim for a gain of 21 yards. While Prescott did a lot of things well, he can still be inconsistent with his ball placement. There were plays where the ball was just not in the correct spot, which led to incompletions and settling for field goals or punts instead of six points. The Cowboys are lined up in 11 personnel with Bryant lined up in the middle of Beasley and Williams in a trips formation. When the ball is snapped, Bryant runs a straight go route into the end zone and has a step on Rodgers-Cromartie. Prescott airs the ball to Bryant, but it’s not thrown in an ideal location. The ball is slightly under thrown and is toward Bryant’s inside where Rodgers-Cromartie has a better chance to make a play on the ball. Bryant is forced to extend his arms with a defender in a great position to break up the pass. A properly placed ball on this play would have been thrown more to Bryant’s outside, toward the back corner of the end zone. This would have given the star wide receiver more leverage and an easier less contested catch. Instead the pass was incomplete as the defender had inside leverage. This is a throw that Romo has made routinely to Bryant in their time together. Here, Dallas is in 11 personnel on this play late in the third quarter near midfield. Dallas runs another play action with a sail concept to the slot receiver side, but rolls Prescott to his right this time. Beasley runs a corner route and separates from the defender as he begins to run toward the sideline. Prescott immediately recognizes that Beasley is open, but sails the throw too high for his receiver. Passes that float like this are candidates for being intercepted and Prescott is lucky that this one wasn’t. The talk of Prescott remaining the starter when Romo is available to return isn’t happening without improved ball placement. When healthy, Romo is one of the most accurate passers in the league, displayed by his NFL-leading 69.9 completion percentage in 2014 and his career percentage of 65.3. Prescott does have a future as the Dallas QB, but he may not take over permanently for a year or two, depending on Romo’s health. Prescott certainly impressed in his first regular-season game, but there is also room for improvement. Dallas should keep playing to his strengths while also lessening the pressure. He threw 45 passes in Week 1, which is way too many for any rookie. Overall, it was a solid performance despite the loss. He played with poise, didn’t turn the ball over, and was in a position to lead his team down the field for a game-winning drive. 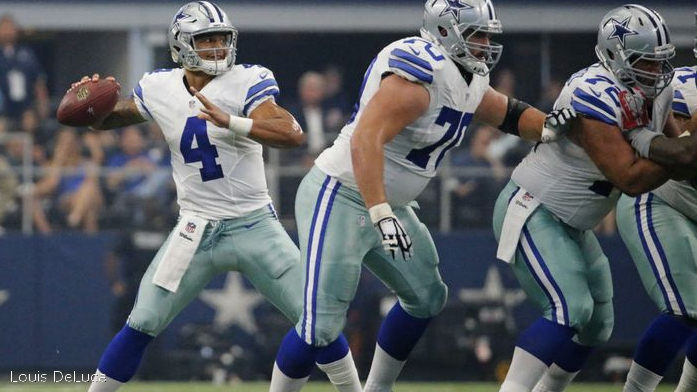 Prescott should continue to develop and improve in the upcoming weeks, especially if the running game gets going. All video courtesy of GamePass.